This chunky little cookbook includes recipes for all the Italian pasta classics, from Spaghetti with Meatballs and Tortellini in Meat Stock, to Ricotta Ravioli and Seafood Lasagne. But it also features a host of recipes for risotto, paella, and Asian rice dishes, as well as chapters on noodles, grains, and soups. Right off the bat, i’ll freely admit I haven’t made many of the recipes in this book in the “Little Big…” series. Mainly, I bought it because my book lust would not be satisfied if I did not buy all the books in this series. The first cookbook I bought was ‘the little big vegetarian book’, followed by ‘the little big mediterranean book’. Both are chock full of low-carb, low-calorie, low-fat recipes that use fresh vegetables, and the latter, meats, fish, lamb and so on. 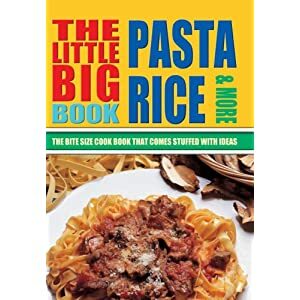 The Little Big Pasta & Rice book will tell you everything you could ever want to know about pastas and rices. There are two main groups of recipes, the first being pasta. This covers the following pastas: long, short, cool, fresh, filled, baked and noodles. The second part of the book covers such rices as: rice (with explanations, pictures of all types), risotto, cool rice. Then the last few chapters cover other types of carbs, gnocci, grains then soups. This would be a cookbook my late Mother would have loved. She loved her carbs and was always searching for new and entertaining ways of making pasta and rice dishes. Mainly, because pasta and rice was so affordable and being a low-income worker, that what was affordable for her, as well as a large portion of Americans, and indeed, around the world. I have too many health issues to eat many pasta and rice dishes, but if I could, I would definitely be using this little compendium more.